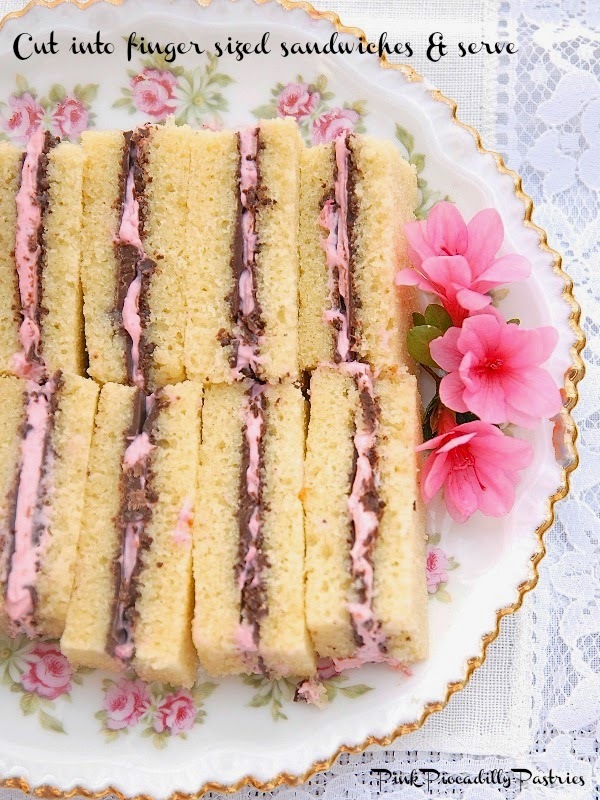 yellow cake, pink filling, and dark chocolate, is an instant tea party. easy to make." It sounded like such a fun recipe, I had to make them!! 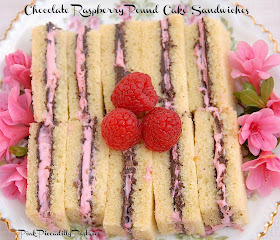 pound cake, it would be even easier!! the sandwiches from getting soggy. trim crusts, and cut into three 1-inch-wide "fingers." into fingers the filling didn't cut as neatly. running, drizzle in the butter or oil. Add the sugar & mix. Add the vanilla & mix. Combine flour & baking powder. minutes.) Let the cake cool in the pan on a wire rack. chocolate; this is to coat and waterproof the cake. Place in refrigerator to set while you make the filling. and serve. Makes about 24 sandwiches. my plate with some pretty flowers from my garden. 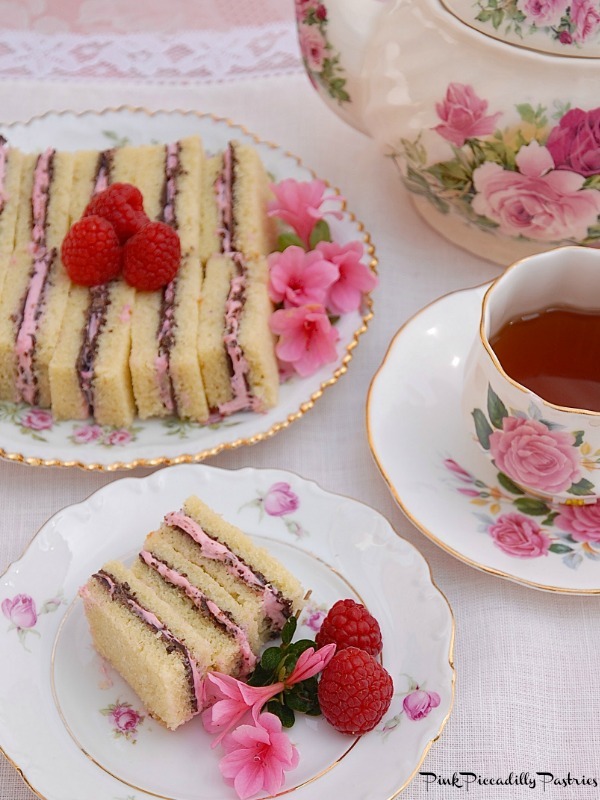 Me and my sister LOVE LOVE your site....you are so inspiring...you make us want to open up a Tea Shop and serve all your yummy stuff. 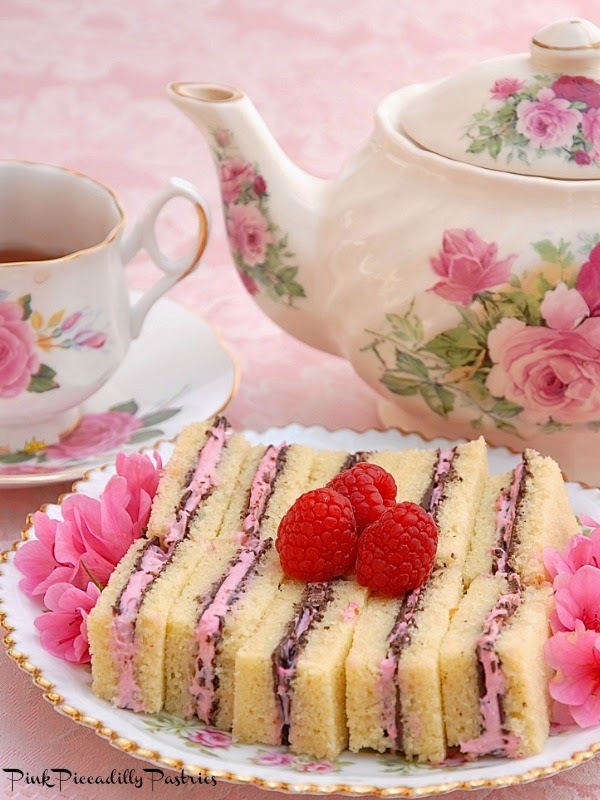 ps..I am hosting my "step daughters" bridal tea and your recipes are finding there way to the table. Thank you for your sweet comment Kittie!!! I'm so glad to have inspired you!! Hope you're Bridal Tea goes well!! Thanks so much for following the blog!!! xo!! Just found you and just love you. You might want to correct something that shocked me when I first read it. Not the recipe itself that comes at the end..but near the top where you picture your making these darlings, you state to cut them in three inch fingers. I think you meant to say ..cut in three one inch fingers". Hi Micki! Thank you so much for your comments! I've corrected the wording and appreciate your bringing it to my attention!! Looking forward to making these for my nieces birthday. Would they be okay to prepare the night before and refrigerate? Hi Amy! I think It'd be fine to prepare the night before because the chocolate will form a barrier and prevent the sandwiches from getting soggy. Thanks so much!! 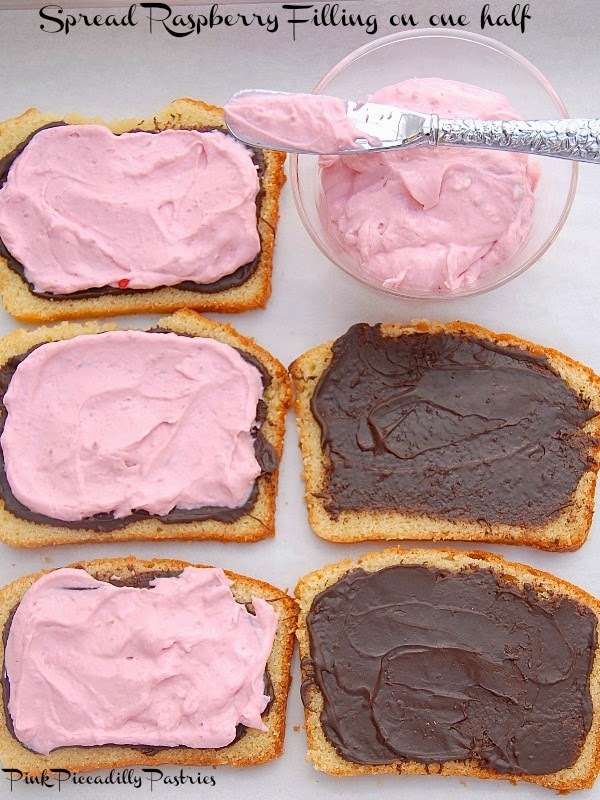 Can you use strawberries instead of the raspberries? I can't stand raspberry seeds. Definitely!! Strawberries would be a great alternative!! 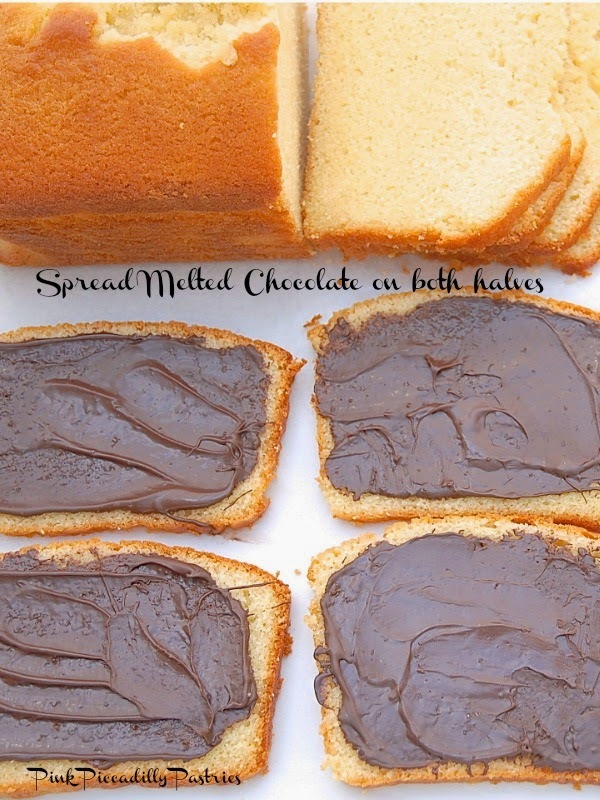 Would Nutella work as an alternative to the melted chocolate? Hi Amanda! Yes! I think Nutella would be a yummy alternative!! Thanks for your question! Would I be able to make this the day before. I like put it in the fridge and bring it out. would it stay fresh? Hi Sally! I haven't tried that yet, but I don't see why not! I wouldn't serve them straight from the frig though. Take them out maybe 15 minutes before serving to let the chocolate soften a bit. Thank you!